New Jersey Russian Blue Rescue View other Russian Blues for adoption. 6/1/17: Meet Alex. 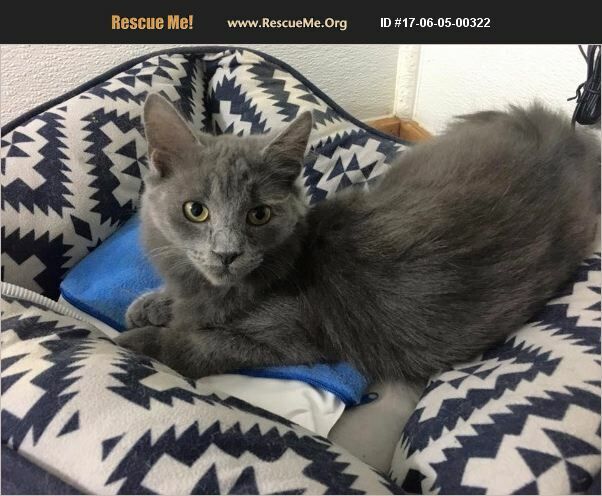 He is about 6 months old and a beautiful Russian Blue mix and long-haired. He was rescued from the hoarding situation. He is currently being treated for a mild URI infection which is clearing up nicely. He is very lovable, sweet and gentle. He had a very rough start in life. Please share let's find him a forever home. He is neutered, up to date on all medical and microchipped. If you are interested in adopting him, please use the following link for our online adoption application: https://ww04.elbowspace.com/secure/20120214123524751639 Please note: Our mailing address is a PO Box and not a physical location to meet or view cats/kittens. All our cats/kittens are in foster homes and can be seen at weekly adoption events.